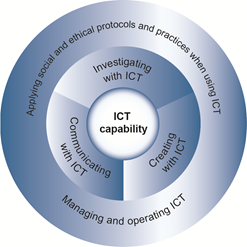 Whilst studying other courses I have read and integrated the ICT capability into my studies and assessment, but have not looked at it in depth as per this weeks learning path. It also states that, “students develop ICT capability as they learn to use ICT effectively and appropriately to access, create and communicate information and ideas, solve problems and work collaboratively in all learning areas at school, and in their lives beyond school,” illustrating the importance of ICT in preparing students for the workplace and the world beyond school. Until reading through this weeks learning path and exploring the ICT capability in depth on the official website, I didn’t realise the organising elements even existed!! So, I have found this picture on the website which summarises these elements well. All of this information highlights the fact that ICT can be integrated into the curriculum in so many ways and with all key learning areas, and hence why it is so important and invaluable to develop a PLN that will enable teachers to connect, share resources and ideas. Nadine’s blog, https://malachielijah.wordpress.com/2013/07/17/11-ways-to-use-technology-in-the-classroom/ has a post entitled “11 ways to use technology in the classroom” which is a direct example of this sharing of resources. Well it’s been 2 full weeks since I registered my blog and logged onto feedly and my PLN seems to be going reasonably well so far. As part of my PLN I have also been following several EDC3100 students. In a recent blog, Kate http://katherinedugdale.wordpress.com/2013/07/29/playing-around-with-blooms-digital-taxonomy/ included some information on Bloom’s taxonomy relevant to the integration of ICTs, which I found very interesting. • Technological content knowledge (TCK) is knowledge in which Technology Knowledge (TK) and content knowledge (CK) are reciprocally related to each other. 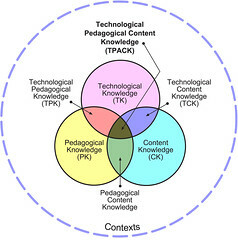 The picture used in the course material and shown below gives a great illustration of how TPACK is a result of the interrelated and integrated components of Technical knowledge (TK), Pedagogical knowledge (PK) and Content Knowledge (CK). Following on from my previous post about personal learning networks (PLNs), I have found this blog, http://www.audreynay.com/2013/07/its-time-to-re-connect.html , which highlights the stages (or life cycle?) of a PLN. Take a look…. I wonder where we currently fit? Am I a creative and productive user of technology? As I reflect on the quotes taken from the Melbourne declaration, http://www.mceecdya.edu.au/verve/_resources/National_Declaration_on_the_Educational_Goals_for_Young_Australians.pdf , in this weeks course content, it emphasised the importance to me of why we, as educators, must integrate and utilise ICTs in our teaching and learning. Simplified, ICTs contribute to the development of ‘successful, confident and creative learners.’ By not using ICTs in our teaching and learning, our students are at a disadvantage, particularly when they enter the workplace. Not only do ICTs encourage critical thinking, creativity, problem solving and so on, but our students will be required to engage with these technologies on a daily basis. How can they possibly do this to their best ability and achieve their full potential when they have not been given opportunities to lay the foundation for these lifelong experiences? When the Melbourne Declaration discusses successful learners, one must ask if this is relevant to teachers- Is it important that the teachers in the Australian Education system are themselves successful learners as defined by the Melbourne Declaration? The simple answer to this is yes. As educators we are required to engage in life long learning, through engagement in professional development, research and any other means that will inevitably help us grow as educators. How can we successful teach is 21st century classrooms if we ourselves are not equipped with the relevant knowledge required to engage with ICTs? It is our responsibility is educators to ensure that we strive towards a goal of lifelong learning, particularly with regard to ICTs, in order to ensure our students are provided with the best opportunities for successful learning outcomes in preparation for their futures. My idea of pedagogy revolves around a strength based approach to teaching, in which educators focus on children’s strengths, and what they can do, rather than focusing on what they can’t do. My pedagogy also holds a strong emphasis on educators embracing a nurturing role towards children, in which children are able to grow into confident, capable individuals. I also have a strong belief in the environment being a major contributor to children’s learning, and the importance of creating an aesthetically pleasing environment, which encourages children’s curiosity and natural desire to learn. I must say that I LOVED the visions of a student clips. They were so insightful, and each of them was a reflection of the diversity of students around the world, each relevant to their own contexts. I was reading through some other students blogs, when I came across this link included in Teagan’s blog, http://traintheteacher.wordpress.com/2012/12/04/10-ways-i-use-my-iphone-in-the-classroom/ and instantly I thought ‘visions of a teacher today’. These are the sorts of activities/ approaches teachers are now required to engage in in order to remain relevant to their students and stay up to date with the demands of a society that is ever-changing and advancing at such rapid rates. It makes me wonder, as we begin our teaching careers, and even 5-10 years down the track, what strategies will we be engaging in in order to remain relevant and up to date?